NEW YORK, August 12 -- The Obama administration's Ambassador to the UN Susan Rice on August 12 gave a speech at New York University outlining the "global challenges" facing the United States. Surprisingly none of those mentioned at the top were in or about Africa. As has happened for months uptown at the UN, she took no questions from the press, and only four from the audience. Nonetheless the hall was packed and high security, testament to the near cult-like status Obama and some around him have in New York City. Beginning her speech, Ambassador Rice listed nuclear weapons in Iran and North Korea, wars in Iraq and Afghanistan, "cyber attacks on our digital infrastructure... and a climate that is warming by the day." How serious, then, is the U.S. about the African issues which make up the majority of the UN Security Council's agenda, from the Congo through Zimbabwe to Somalia? Rice's putative boss Hillary Clinton, at the beginning of her recent rocky trip to Africa, simultaneously announced increases in weaponry to Somalia's weak Transitional Federal Government, which controls very little territory in the country, while denouncing Eritrea for interfering in Somalia. The seeming contradiction should be explained, one assumes by the American Ambassador to the UN where Somalia is discussed. But so far there's been no chance. Almost nowhere in Rice's speech was any real reform of the UN mentioned. American taxpayers, it was revealed this year, were ripped off by the UN in Afghanistan. What has been the follow-up? In the debate on peacekeeping, what is the American proposal on how to try and discipline soldiers accused os sexual abuse? Ambassador Rice has not said. The problem of nepotism is a theme at the UN this summer, from the UN Development Program to the UN Office of Project Services. The US Mission to the UN has had nothing to say on these topics. If the U.S. stops pushing for reform and clean up the UN, who will? Susan Rice in agreement with UN's Ban: immunity = impunity? Rather, they promoted to the UN press corps Susan Rice's speech at NYU, as if it would answer questions. In the run-up to the event, Inner City Press was told that if there were time, there would be a Q & A. Of course, Ambassador Rice would be the one to choose if there was time. Nevertheless in good faith Inner City Press went and arrived on time. In a half-filled overflow room, Ambassador Rice spoke on a video screen, reading verbatim from a previously circulated speech. Inner City Press' renewed request to be present for the Q&A was finally granted, to the US Mission's credit -- at first they'd responded that since the questions would not be from the press, it made no difference where one was. In fact, it did: inside the room, in front of both UN and US flags, Amb. Rice held forth at length. Afterwards four questions were taken. Former Congressman Brademas who runs NYU asked if Rice has had any problems with Russia and China. Surprisingly few, she answered. One wondered: what about Sri Lanka and the carnage there? What about Zimbabwe and now Myanmar? Amb. Rice said that her Russian counterpart -- Vitaly Churkin -- had called her as she drove to give the speech to ask about it. Can you say, Abkhazia? The second question concerned Iraqi refugees; the third was about terrorism. In response, Amb. Rice said she will be sponsoring an Iftar dinner at her residence, which is in the Waldorff=Astoria. The security in the room was surprisingly tight. For the final question, Amb. Rice picked the questioner, in the name of gender balance. Partisan balance too, at least on paper: the questioner said she'd worked for former Ambassador Khalilzad, and asked if Rice knew how to "break the voting blocks" in the General Assembly. Rice said if she answered honestly, it wouldn't help the breaking. And then it was over. 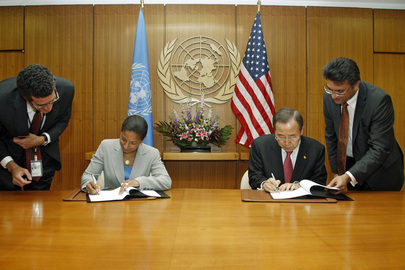 UNITED NATIONS, August 5 -- In a rare press availability at the UN, US Ambassador Susan Rice made much of recent Congressional action which will allow the U.S. to make up its peacekeeping payment arrears, to the tune of $2.2 billion. Neither to the Press nor in her Security Council speech, however, did she mention the problem of sexual abuse and exploitation by peacekeepers nor the lack of transparency when disciplinary action is meted out, if ever. This lack of focus on issues of reforming the UN contrasts not only to previous U.S. advocacy in and about the UN, but even with Secretary of State Hilary Clinton's stated goals for her trip to Africa, particularly Goma in Eastern Congo. To talk about UN peacekeeping without any focus on "first do no harm" is a strange position for the U.S. to be taking. Then again, the U.S. hardly contributes any personnel, even military observers or police. 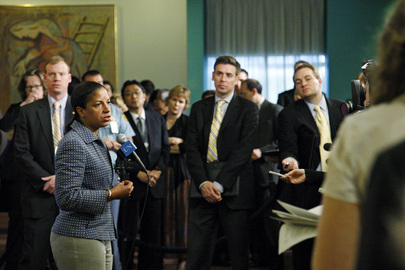 The press stakeout by Susan Rice, and presence of the U.S. Mission's spokesman were both rare enough these days that they drew attention and comment from the UN press corps. Journalists speculate that Susan Rice, so often in Washington these days, would like to return there full time. Some say she's gunning for Hilary Clinton's job, but may have to wait some time. An overall theory of the Obama administration's seeming lack of engagement with the UN so far this year is that, as with Myanmar and North Korea, they have been conducting a review before doing anything. Obama's first visit to the UN next month, on climate change and non-proliferation sandwiched around a trip to Pittsburgh where and when the Administration chose to locate the G-20 meeting, smack in the middle of the UN general assembly meeting but hundreds of miles away, will mark a new beginning. Some say more will be demanded of Secretary General Ban Ki-moon. Perhaps even UN reform issues will finally be raised. Watch this site.